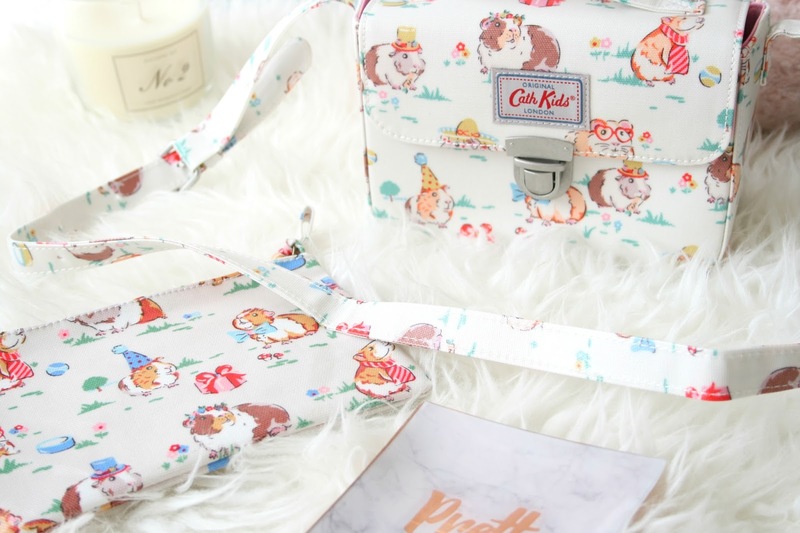 Firstly I placed my first ever order on Cath Kidston, she has a whole range of stuff just covered in little Guinea Pigs dressed up to go to a party and its ADORABLE. I picked up the kids stuff because I am a child obviously! I couldn't not buy the bag, I mean look at how adorable it is. I only realised when taking these photos that it says 'Cath Kids' on it but we'll pretend it doesn't. This is for children so it is very small and I just about get away with using it as a bag. My purse doesn't even fit in it so I basically just have to pop my money and cards all loose in it when I want to use it. But like I said I honestly couldn't not get it. To match that I also bought the little pouch, I'm not entirely sure what I'm actually going to use this for as it is quite small. I'm thinking like for essential makeup bits you need incase you need a top up throughout the day, so basically powder, liner, lipstick and concealer because thats literally all it will fit. But again the print is so blooming cute that I couldn't not buy it. The bag was €20 and the pouch was €8. 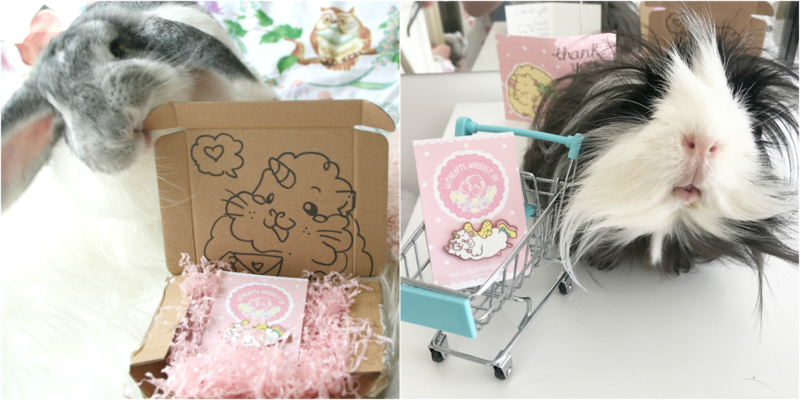 I then found the most amazing shop that sells stationary and pins and mugs etc on Instagram that just has Guinea Pigs all over them and fell in love, so I had to place an order. I've already placed another order from this store and I'm so excited to receive it all. Okay prepare for cuteness! Did you just squeal at the cuteness? Because when I opened this thats exactly what I done! 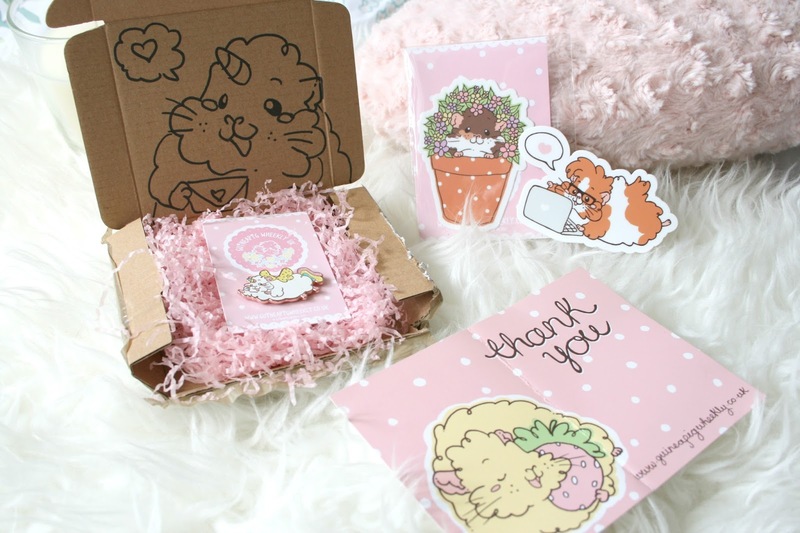 Also before we talk about the products can we talk about the adorable little Unicorn GuineaPig doodle that was hand drawn on the box because I haven't thrown the box away because of this. Everything in this picture and the ones below are from GuineaPig Wheekly and you can find the website to shop and find more information all about the person who runs it and her piggies here. 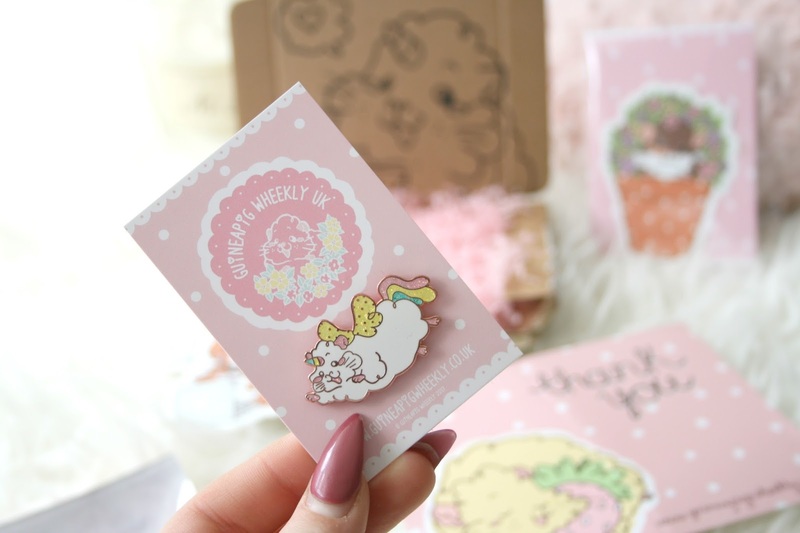 So I'm going to start with the pin because that was the reason I had to place this order because just look at it. It's a Unicorn GuineaPig and I honestly don't think I've ever seen anything cuter. I bought this for my work uniform and its actually so much bigger than I expected it to be I love it. My uniform is black which also means because its body is white it really stands out and the amount of people who have commented on it makes me so happy and I'm just like ISN'T IT ADORABLE. I also purchased two adorable stickers, 1 for each side of my iMac which they currently live. 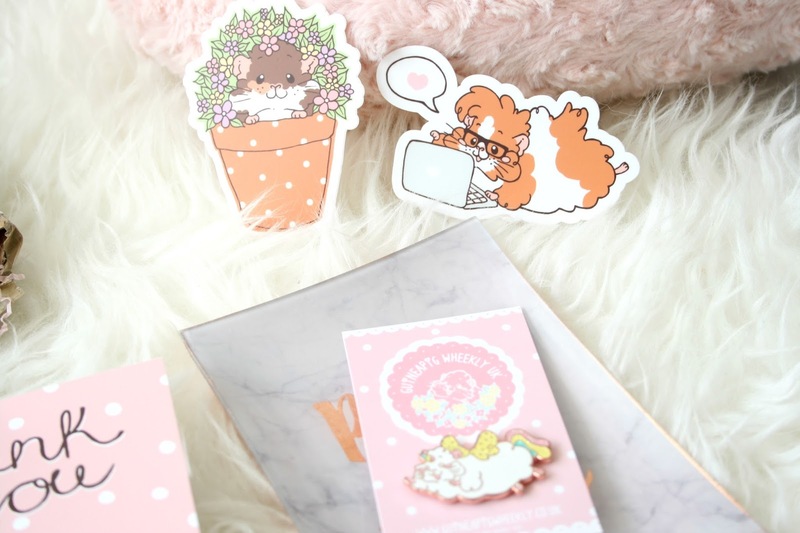 The GuineaPig chilling on his laptop is my absolute fave thing ever and I'm going to order another one because I need it to put on the front of my MacBook now aswell (although my second order has two more stickers on the way which I'm excited about). The little fellow in the flowerpot to just took my heart and I couldn't leave him. The stickers are such good quality and I just can't get over how adorable they are. As everything was GuineaPig related Aurora was very upset over it and immediately wanted to get rid of everything. She even tried to start chewing the cardboard box, silly toothless Bunny! Sheldon on the other hand loved that everything looked like his little friends as you can tell. If you sign up to the GuineaPig Wheekly newsletter you'll receive 10% off your first order which is great and you don't get bombarded with mails! This range is so cute! I need everything haha!